Gun Salutes are the firing of guns or firearms as a sign of respect which is used to mark special occasions or as a military honour. The practice of firing gun salutes has existed for centuries on both land and sea where warships would fire their cannons harmlessly out to sea, until the ammunition was spent, to signify their guns were empty and they had no hostile intentions. By 1730, the Royal Navy was firing 21 gun salutes to mark certain anniversaries, which was to became the mandatory salute to the Royal family in the eighteenth century. 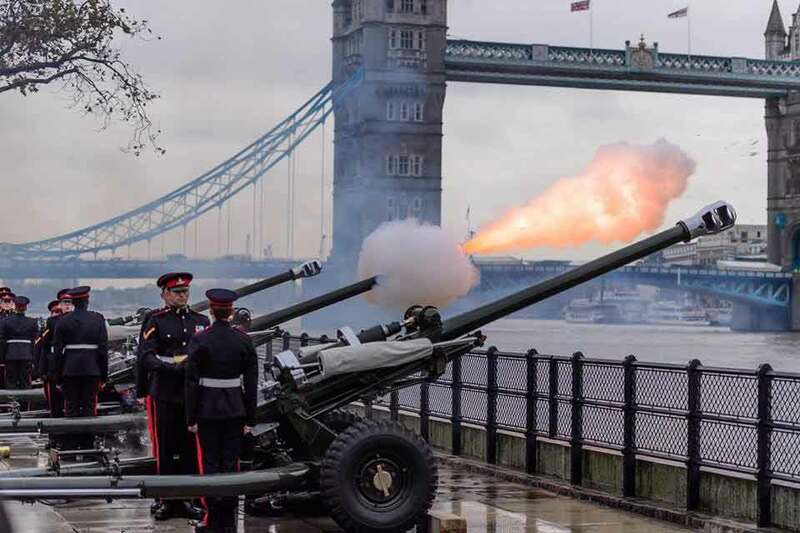 Although the 21-gun salute is the most commonly recognised, the number of rounds fired for any given salute varies depending on the occasion and rank of the person to whom honours are being rendered. The number of rounds fired in a Royal salute depends on the place and occasion. For the basic Royal salute 21 rounds are fired. In Hyde Park an extra 20 rounds are fired because it is a Royal Park. The basic 21, plus a further 20 because the Tower is a Royal Palace, plus another 21 'for the City of London'. On other occasions 41 rounds are fired. A 124 rounds are fired when the Queen's official birthday coincides with The Duke of Edinburgh's birthday. On these occasions 62 rounds each are fired. Gun salutes are also fired to mark Royal births and when a visiting Head of State meets the Queen in London, Windsor or Edinburgh. There are military saluting stations in London, Edinburgh Castle in Scotland, Cardiff and Hillsborough Castle in Northern Ireland. In London, salutes are fired in Hyde Park and at the Tower of London. 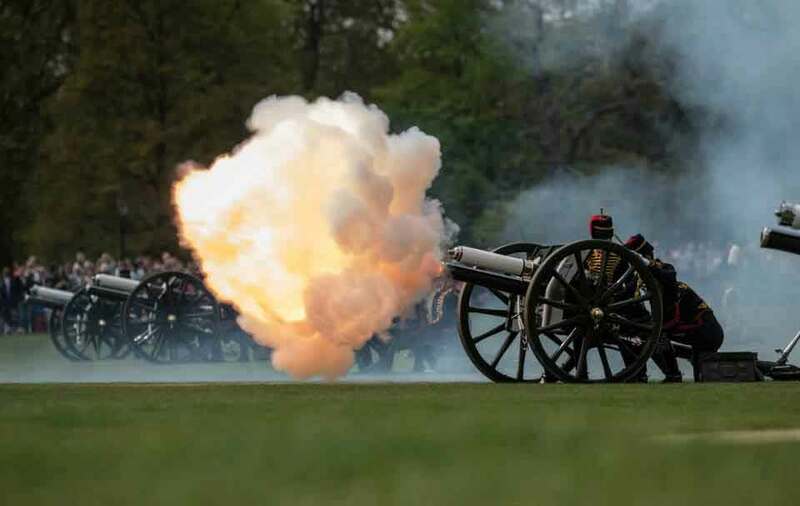 On State Visits, at the State Opening of Parliament and for The Queen's Birthday Parade, gun salutes are fired in Green Park. Salutes in Hyde Park or Green Park are fired by The King's Troop, Royal Horse Artillery. The first round is fired at 12:00, or 11:00 hours on The Queen's official birthday. At the Tower of London, the salute is fired by the Honourable Artillery Company at 13:00 hours. A salute with the open hand was used historically to show that no weapon was concealed in the palm. 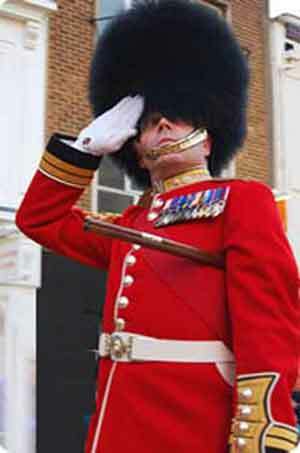 Salutes in the British Army's are given with the right hand palm facing forwards with the fingers almost touching the headdress. The salute is given to acknowledge the Queen's commission. The subordinate salutes first and maintains the salute until the superior has responded in kind. Kings Troop Royal Horse Artillery is the saluting battery of the Household Division. As well as firing of Royal Salutes in London on Royal Anniversaries and State Occasions, they provide a gun carriage and team of black horses for State and Military funerals.